Have your company logo, company name, or just about any special message professionally printed repeatedly throughout your ceremonial ribbon of any size. This product offers full color printing on white ribbon only. Most of the other ribbon colors can only be printed in white or black ink. Some ink colors like gray, brown or navy may work on light color ribbons. Dark color ribbons should only be printed with white. If you are in doubt about the selection you should make, please contact us for a quote by calling us at 1877-373-4273 or e-mailing sales@ceremonialsupplies.com). Select from ribbon widths of 4, 6, 8, 10 inches and lengths of 10, 15, 20, and 25 yards. All custom printed ceremonial ribbon has a soft satin finish with a light shine that will help your personalized design stand out even more! Draw some extra attention to your ceremonial stage with a bold choice of ribbon. 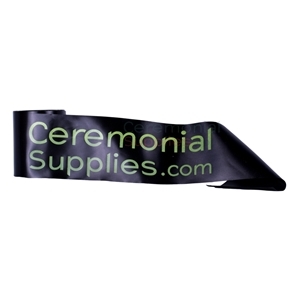 Our Extra Wide Ceremonial Ribbons come in two sizes: 25 yards x 8in. and 25 yards x 10 in. Get them in red, white, and blue. For maximum visibility, you can choose from two options - either 4 inches or 6 inches in width to fulfill your needs. 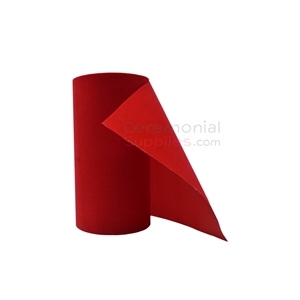 The ribbon is available in two lengths - 25 yards and 50 yards to ensure there is an adequate amount left post your ceremony to be used elsewhere. 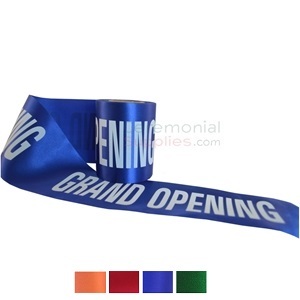 The Royal Blue Printed Grand Opening Ribbon comes with the words 'Grand Opening' printed on it. Available size variants include: 12 inches in length with 4 inches in width; 12 inches in length with 6 inches in width; 25 inches in length with 4 inches in width; 25 inches in length with 6 inches in width. 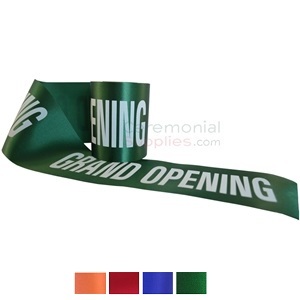 The Green Printed Grand Opening Ribbon comes with the words 'Grand Opening' stamped repeatedly across. It can be purchased in multiple length and width combinations to fit every need. Available variants include: 12 in. length X 4 in. width, 12 in. length X 6 in. width, 25 in. length and 4 in. width, and 25 in. length X 6 in. width. Vibrantly colored Hot Pink Grand Opening Ribbon add life to any ribbin cutting ceremony. Get it in a variety of sizes to fit your needs (in L x W): 25 Yds x 4 In, 25 Yds x 6 In and 50 Yds x 4 In. 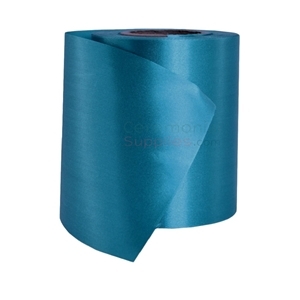 Plain Teal Grand Opening Ribbon has distinctive color that will accentuate your brand's liveliness. Get it in 25 Yard length with option of either 4 or 6 inch width. The Plain White Grand Opening Ribbon is available in a soothing shade with a high gloss satin finish. 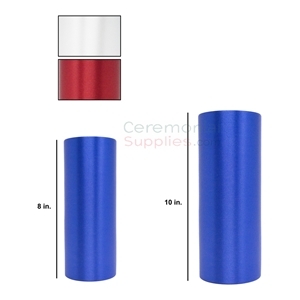 You can get it in sizes 4 or 6 inches wide and it is available in two different lengths, 25 and 50 yards, depending on the size required for your ceremony. 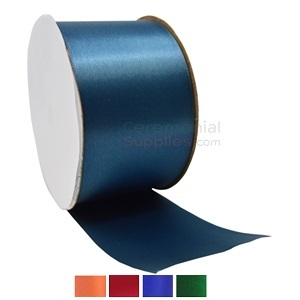 With its satin finish, 2.25 inch width X 50 Yard length and multiple color options such as teal, royal blue, gold, orange, and hot pink you can comfortably use this polyester made ribbon to either make bows, or use as a complementary ribbon for special extra wide ribbons. The adequate length ensures you always have enough length left to use for a variety of purposes. 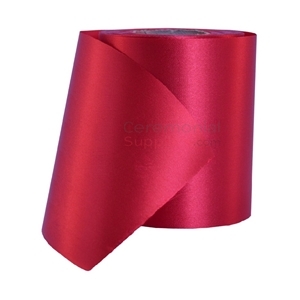 A multipurpose ribbon that can be used in red carpet events, grand openings, or as a festive decoration, this attractive red velvet ribbon is a must have. With a 4 inch width and 25 YDS in length, it takes care of your visibility needs while ensuring you have an adequate amount left over. 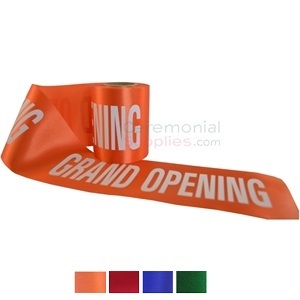 Purple ceremonial ribbon to add a splash of color to your grand opening ribbon cutting. This deep purple wide ribbon comes in options of 4" W X 25 Yards or 4" W X 50 yards in length. Grand opening ribbon is the focus of every ribbon cutting ceremony; after all, it’s in the title of the event. It is important to choose a ribbon that represents your company well. The colors should be bold and vibrant, preferably matching your company’s color schemes; the width should be no less than 4 inches, making the ribbon easily visible in pictures and to your on-site guests; and if you opt for a printed version, the font should be legible from a distance so that the message is clear. Cutting the ribbon is what gives meaning to a grand opening as the act symbolizes the breaking of a seal on something new. Likewise, a ribbon cutting ceremony will introduce your business, merger or cause as a new prospect for your guests and your community to admire. The right ceremonial ribbon will go a long way. As ceremonial grand openings are becoming increasingly popular, the need for ribbon cutting supplies is also on the rise. The type of material used in these events is considered a specialty product—as just any ribbon won’t do. 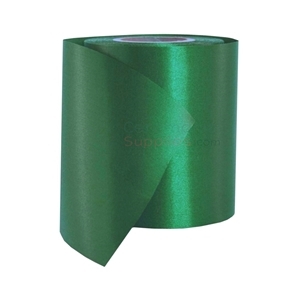 Extra wide ribbon is uncommon in the market since not many industries require it. 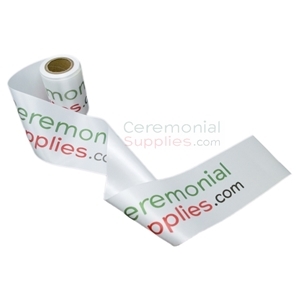 At CeremonialSupplies.com, we facilitate access to specialty ceremonial ribbon for grand openings and inaugural events. We help you deliver the right message to your audience with quality grand opening products. 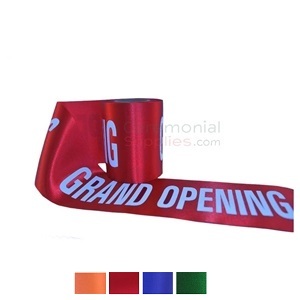 Available in a wide array of colors and sizes, our ribbon will work wonders for any organization aiming to impress the public with a grand opening ceremony. The soft satin finish of the fabric adds a delicate shine that reflects well in pictures and videos of your ceremonial opening. Choose from plain versions, pre-printed Grand Opening ribbon and customized options with text stamped across to convey the message of the reason for your ceremony. Extra wide ribbon is necessary because (as prior mentioned) visibility is a big factor in your event. If you are using oversized scissors to perform the ceremony, it only makes sense that the ribbon being cut is proportional to the size of the scissors. Using over-sized supplies for your ceremony is more than standard tradition; they also serve as great props for photo opportunities which turn into great marketing materials and keepsakes. The ribbon itself may be preserved and stored after being cut to commemorate the day of your grand opening for years to come. Having a wide-enough ribbon to display will make your framed or encased memento one to admire. 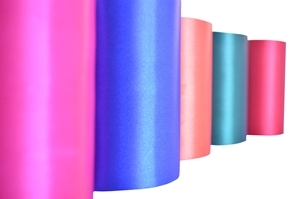 You can get our wide ribbon in rolls of 25 or 50 yards of the plain version and 12 or 25 yards of the pre-printed option. We have some of the most popular colors including red, royal blue, green, orange and white, but we also carry special colors like hot pink and teal which are excellent décor for events even beyond grand openings. The width of the ribbon available is either 4 inches or 6 inches; both are fine options that will suit you depending on your preference. We also have 2.5 inch ribbon which is excellent for additional decorations like streamers and bows that may accompany your ribbon on each end. 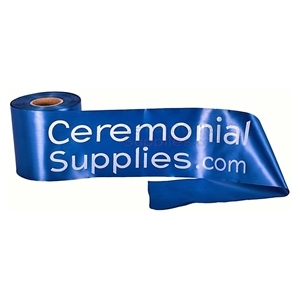 CeremonialSupplies.com is your best bet when selecting grand opening ribbon for your ceremony. We offer courteous and professional customer service support to ensure that all of your business’s needs are met. 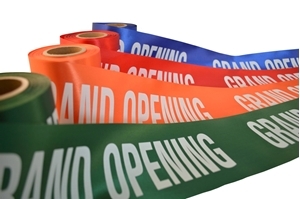 Ceremonial ribbon is a just one of the many products that we can supply to help you have a successful grand opening event. Your success is our success, so we strive to give you the best that the industry has to offer.